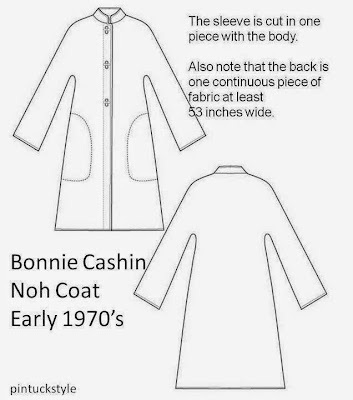 The well known mid-century American fashion designer, Bonnie Cashin, began to find her signature style in the late 1940's, and this design patent from 1949 shows two of her popular design elements together in one garment. The Noh coat, an Asian inspired garment would be part of her 'look' for decades. 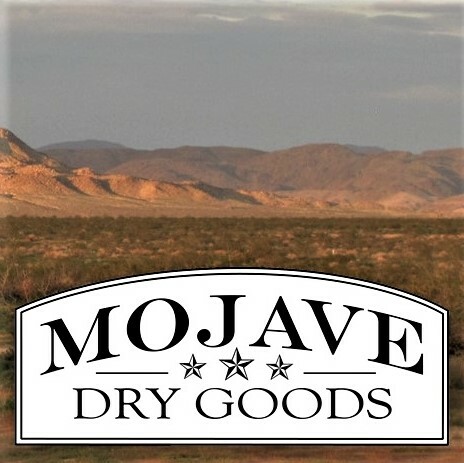 In this design we find it in its early stages of development. The silhouette is consistent with her later designs. As this look developed, she would venture further into a timeless cut by excluding the bust dart that starts on the the shoulder seam. That would create a flat pattern, without shaping. This is a draft taken from a later Noh coat, dated from the early 1970's. Here her classic lines are seen: a flat coat that is cut with the sleeves in one with the body. Like the coat from 1949, it includes a small mandarin collar and large, roomy pockets. This helps us to see how Bonnie Cashin refined her early designs to reach a style that she felt was classic and suitable to her range of textiles, colors and layering concepts. The other design element in the 1949 patent that became part of the Cashin design vocabulary is the concept of using a clasp purse as a pocket. This diagram shows the clasp coin purse open, the full coat draft shows that same purse folded forward. This delightful and quirky detail continued to appear in designs through out her career, including the leather handbags she would design for Coach. An example from 1954 showing a plaid skirt with purse pocket is on the MET website HERE. 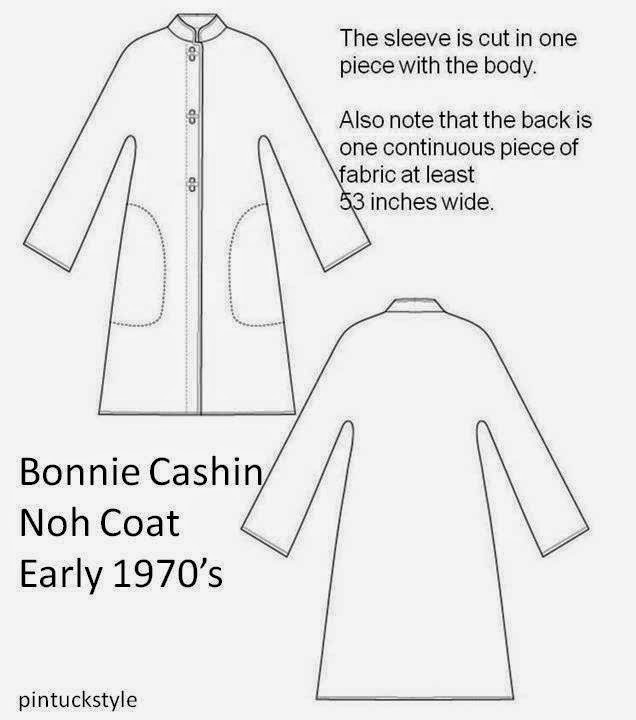 So, this coat patent may be of a style that might seem fairly typical for the late 1940's or 1950's, but upon closer inspection it is a key starting point in the signature style of a major American fashion designer, Bonnie Cashin.